wistyria.com - What is Needle Felting? Needle felting is a process which uses barbed needles to interlock wool fibers to form a more condensed material. Wool fibers have scales which when rubbed against each other catch and lock into place to create this denser material called felt. Felting needles are used to entangle the fibers. As the felting needle is moved up and down, the barbs on the needles catch the scales of the wool and entangle them into place. There are many sizes of needles available to use for needle felting, but the most popular are the #36, #38 and #40 triangle points and also the #38 Star Point. 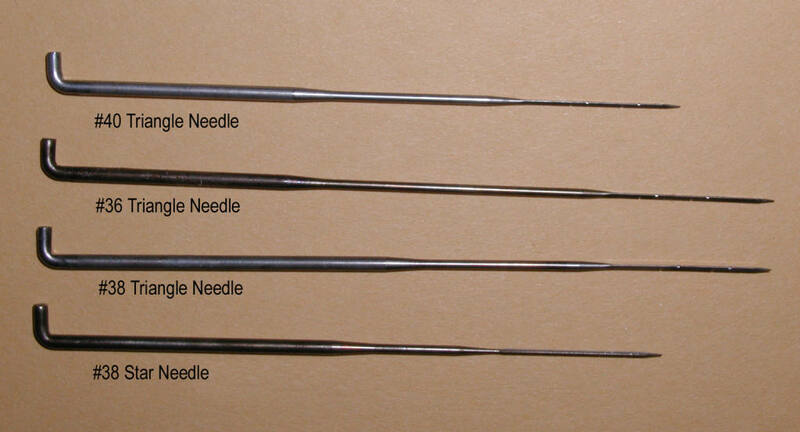 The triangle pointed needles have three sides on the end, each having notches or barbs along those sides. The larger the needle number the finer the hole that is left after you have punched with it. The #36 triangle point is most commonly used for coarse, fast felting. It does leave large holes so you have to go over the punched surface with a finer needle if you want to hide them. The #38 triangle needle is a great all purpose felting needle. I prefer this needle to attach felted items to a surface and also for securing layers of felted objects together. The #40 triangle needle is used for fine details, such as sculpting faces, forming curved flower petals and any other small area where you want the design to be perfectly shaped. The star point needle has 4 sides with notches or barbs along the sides. Because it has one extra side, this needle is excellent for fast, fine felting. There are many multi needle hand tools available to hold 3-25 needles, if you're going to tackle a large project. Some of them have handles that open so you can change the needle size. These make felting larger pieces much easier. There are also needle felting machines available now. They are much like a sewing machine but have been designed to hold felting needles. They certainly speed up the felting process, but you will still need to use the needles by hand for the fine detail work. Felting needles are very sharp and should not be used by children or anyone with a visual handicap. It only takes one jab to cut your finger. It's necessary to keep your eye on the needle at all times when it's moving! No exceptions to this rule. · Always hold the needle at the top just below the bend at the top. · NEVER do any punching without keeping your eye on the needle. Ends are sharp and you could cut yourself. · Always hold the needle vertically to the surface you are working on to prevent breaking the needle. The needle is more efficiently felting when held vertically. · Do not apply pressure with your finger against the side of the needle at an angle or you could break the needle. · Place needles back into the plastic sleeves and in the bag they came in. · When layering fibers, always alternate the direction of the wool from layer to layer, going opposite directions. First layer vertically, next layer horizontally and repeat if more layers are required. · Do not use needles on wet wool. They could rust. · Needle felting should always be done on a piece of foam 2” thick by 8" x 6”. You should always place foam on a firm surface while working. NEVER DIRECTLY ON YOUR LAP!! · It’s important to keep turning your piece from side to side while working on it to prevent it from bonding to the foam. CAUTION: Felting can be addicting!